Moss, the family-friendly puzzle platformer developed by former Bungie employees, released exclusively for PlayStation VR in February 2018, and instantly became one of our favorite PlayStation VR games. Now, after just a few months soloing on Sony’s VR headset, Moss has officially launched on the Oculus Rift, HTC Vive and SteamVR. That means Moss is now available on some of the best VR headsets around. 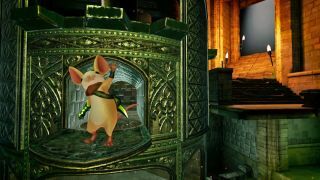 PC owners will finally have the chance to play with Polyarc’s brave adventuring mouse, Quill, through a variety of challenges. The game developer has priced Moss at $30 or £25 across all platforms, which will get you about four hours or so of solid puzzle gameplay. That's around or slightly above the average length for most VR experiences currently available. In the game, you guide Quill the mouse as she explores forests, ruins and other environments. The twist is that you can also control these environments as well. From a third-person perspective, you can pull obstacles out of her way or drop objects on enemies to gain a tactical advantage. Or, you can simply control Quill’s actions directly. Polyarc programmed Quill to make eye contact with the player, and use gestures and even sign language to communicate with you and make an emotional connection. You, in return, can wave at, pet or high-five Quill. Rick Lico, Animation Director at Polyarc, said in a blog post that he wanted to convince players that Quill had a “soul” and cultivate a real emotional bond between player and character. Based on how much sheer enjoyment we got out of Moss, we’d say his team succeeded. Excitingly, in the comments of the post, Lico revealed that Polyarc has already begun development on “Book 2” of Moss, and that they’re “working hard” to ensure it doesn’t take as long as the first game—three years—to release. For now, if Moss sounds like your kind of experience, you can find the original game on the Oculus Store, Steam app, and Viveport. PlayStation VR owners, meanwhile, should keep an eye on all of the E3 2018 news coming from Sony this week and next. Sony has promised to release new exclusive PSVR titles in the coming days, as a countdown to its big show on June 11.